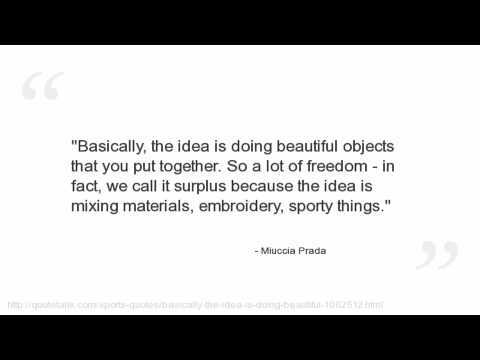 See the gallery for quotes by Miuccia Prada. You can to use those 8 images of quotes as a desktop wallpapers. I love clothes. Maybe I can say I don't love fashion, but I love clothes completely. 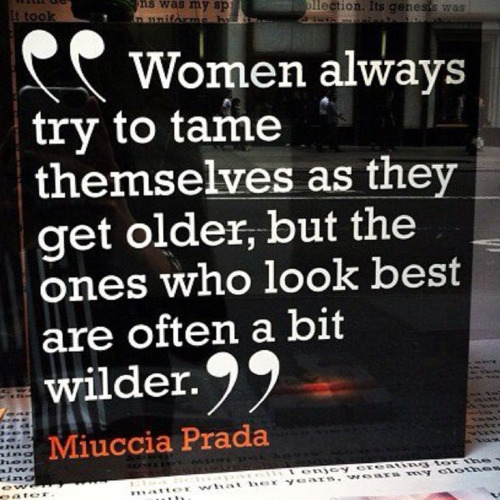 I would say there is no Prada woman. I'm interested in women in general. I don't have any kind of preference. My learning process is by eye alone; it's not at all scientific. My parents were truly severe. Nostalgia is a very complicated subject for me. I'm attracted by nostalgia but I refuse it intellectually. One's life and passion may be elsewhere, but New York is where you prove if what you think in theory makes sense in life. 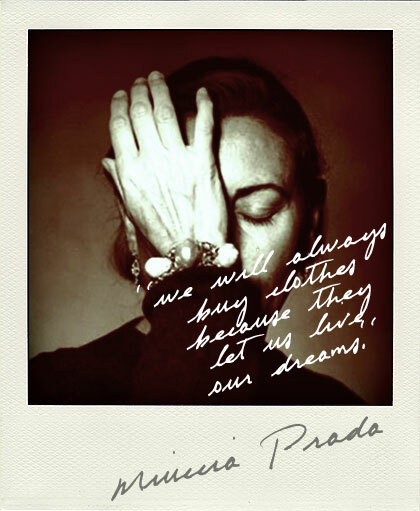 Talking about the democratization of fashion is just one of the many trite things people say these days. The process of a date, I think, is terrible. Horrible. Because everything is banal and predicted. Usually my ideas come from what I don't want to do, or what I find is old. What interests me most is when a work of art is no longer just an object, but also touches reality and life. You have to always work against what you did before, and even against your taste. Many of us grew up with a kind of puritanism against shopping. But shopping can be much more than how it is cast. If you are bored or you have problems, it can be a way of lifting your spirits, by doing something light and superficial. Why not? Women often don't want to admit that they like fashion. 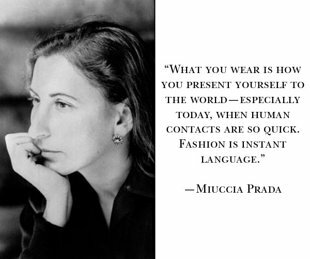 And yet fashion enthralls everyone, from the taxi driver to the mega-intellectual. I have often asked myself why this is. I don't know the answer. 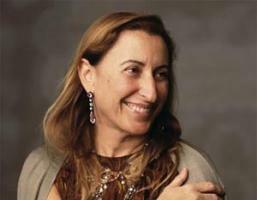 Much more quotes by Miuccia Prada below the page. I want to make clothes that are beautiful of course, but also clothes that are interesting and considered and intelligent and not out of place. Basically I'm trying to make men more sensitive and women stronger. 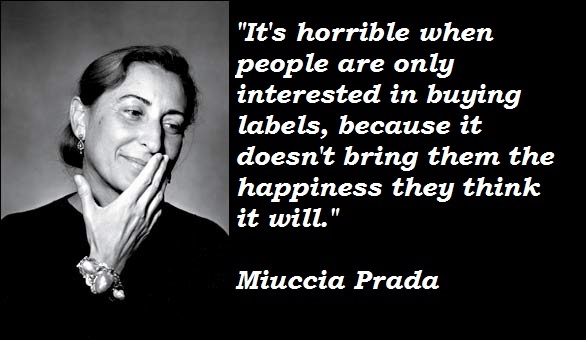 It's horrible when people are only interested in buying labels, because it doesn't bring them the happiness they think it will. The moment you start being in love with what you're doing, and thinking it's beautiful or rich, then you're in danger. Every day I'm thinking about change. Fashion fosters cliches of beauty, but I want to tear them apart. 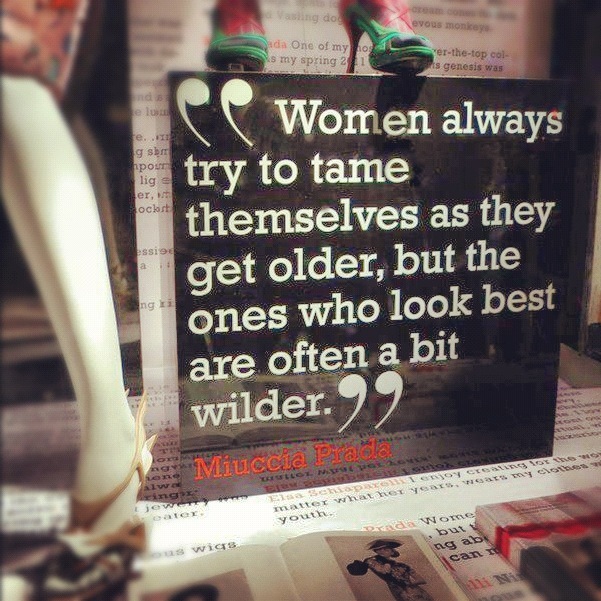 I hate the idea that you shouldn't wear something just because you're a certain age. I was a communist, but being left-wing was fashionable. I was no different from thousands of middle-class kids. I am interested in communicating with the world by selling to many people. I do what I think is right. I had no fun. My family was too serious. I have to say that my husband and my children are so tough, there really is no space for pretension.